Cleophus J. LaRue, Princeton Theological Seminary’s Francis Landey Patton Professor of Homiletics, received his BA and MA degrees from Baylor University, his MDiv and PhD degrees from Princeton Seminary. 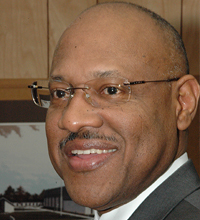 He specializes in the theory and method of African American preaching and worship. An ordained minister in the National Baptist Convention of America, LaRue is the former pastor of two churches in Texas as well as the former interim pastor of churches in Harlem and Jamaica Queens, New York. He is a frequent speaker at churches, seminaries, and conferences throughout the country and is a member of the Academy of Homiletics.